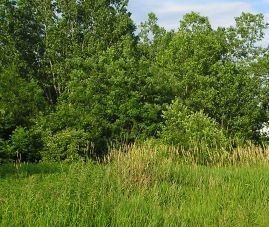 Wetlands include marshes, wet meadows, swamps, bogs, wooded swamps, and similar areas. Wetlands in Illinois are most common on floodplains along rivers and streams (riparian wetlands), in isolated depressions surrounded by dry land, along the margins of lakes and ponds, and in other low-lying areas where the groundwater intercepts the soil surface or where precipitation sufficiently saturates the soil (vernal pools and bogs). Hydric Soils - Soils which present certain characteristics when saturated. Hydrophytic vegetation – Plants which grow in water or saturated soils. Hydrology - Saturation of soils with water. Wetlands provide a multitude of ecological, economic, and social benefits. They provide habitat for fish, wildlife, and a variety of plants. Wetlands are nurseries for many fish and shellfish. Wetlands are also important landscape features because they hold and slowly release flood water and snow melt, recharge groundwater, act as filters to cleanse water of impurities, recycle nutrients, and provide recreation and wildlife viewing opportunities. Wetlands are protected by both federal and local regulations, governed by the U.S. Army Corps of Engineers and the DuPage County Stormwater Management and Floodplain Ordinance adopted by the City of Warrenville. Proposed development plans must first attempt to avoid and then minimize direct or indirect impacts to a wetland. If avoidance is impracticable, the loss of the wetland and buffer must be mitigated / replaced. Supporting documentation must be provided to the city along with the stormwater permit submittal in accordance with the Stormwater Ordinance. For more information about City of Warrenville wetland regulations or to set up a pre-application meeting with the Senior Civil Engineer, please call 630-393-9050.